I (finally) bought Nigella’s Kitchen last week. I spent a bit of time looking at it and I’m loving it so far – I think I might actually cook from it quite a lot, for a change! I chose to make these muffins first as I was running out of most types of food in the house but had everything for this recipe. Well, almost everything: I stole the bananas off the housemate and, embarrassingly, substituted the sunflower oil for olive oil. Bad times. They tasted very odd, really olivey, and my first attempt at cooking from Kitchen had been a failure. Not wanting to be defeated by a recipe and my stupidity, I attempted them again a few days later. 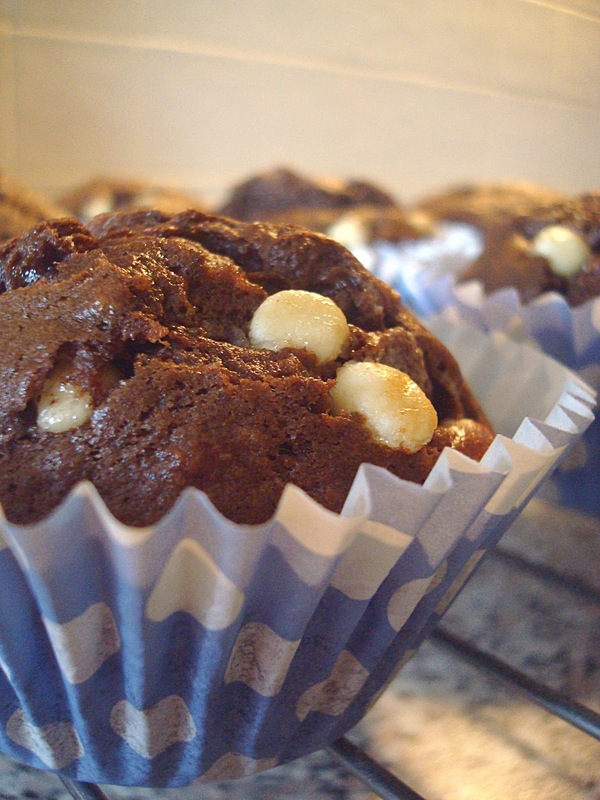 I bought sunflower oil, upped the sugar and added some extra chocolatey goodness. Result! Add the oil, eggs and sugar to the mashed bananas and beat using a hand whisk. Mix the flour, cocoa and bicarb in a separate bowl, pass through a sieve and add it to the banana mixture. Continue beating slowly until all the flour has been incorporated. At this point I spooned half of the mixture into another bowl and mixed in the white chocolate chips. I then spooned the mix into 6 muffin cases. 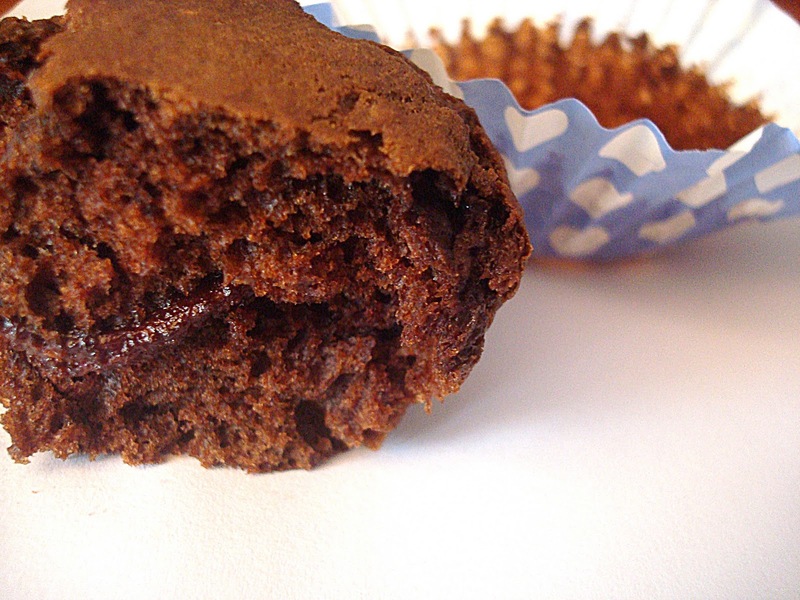 For the Nutella muffins, spoon mix into 6 muffin cases but only half way up to where you normally would. Add a spoon of Nutella on top of that layer, and more muffin mix on the top. Bake everything in a preheated 200 degree oven (mine was only 180 as it’s fan assisted) for 15-20 minutes, or until a knife comes out clean from the centre. I’m not sure which ones I prefer. Even with 50% more sugar than the original recipe, the muffins are not sickly sweet so the white chocolate chips are a great addition. But I have a soft spot for the Nutella/banana combination and I loved the soft gooey Nutella blob at the middle of each muffin. Since the muffin mix is a bit thicker than the cupcake mix, the Nutella didn’t sink to the bottom like in the hazelnut cupcakes. Take your pick, or make both.